Election 2018: How Matt Haney surprised everyone. Even himself. Haney recorded close to 60 percent of the vote, and was 30 points up at the end of the night. He had 500 people out on the street yesterday. He has declared victory. Hindsight is always 20/20, but Haney’s big win is less surprising when you begin analyzing his approach versus his opponents’. He got money and people into the field early, countering a late cash dump from outside interests. He got big-name endorsements from mainstream figures, such as Gavin Newsom or Kamala Harris — which convinced the more affluent voters in District 6 that he was no crazy lefty. He then used that as cover to run an intense on-the-ground campaign. 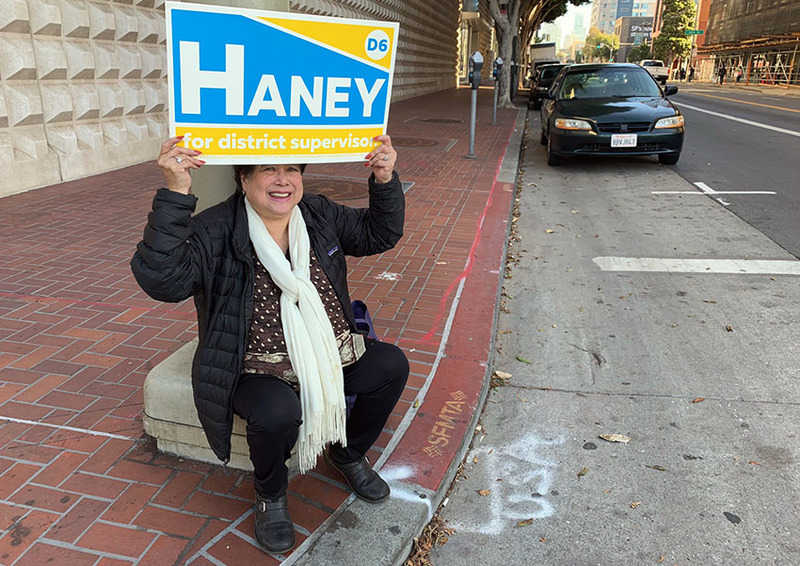 Sen. Scott Wiener was a huge Trauss supporter, but Haney’s approach of knocking on thousands of doors and targeting thousands of voters looks an awful lot like the approach Wiener used to win the District 8 supervisor’s race a decade ago. 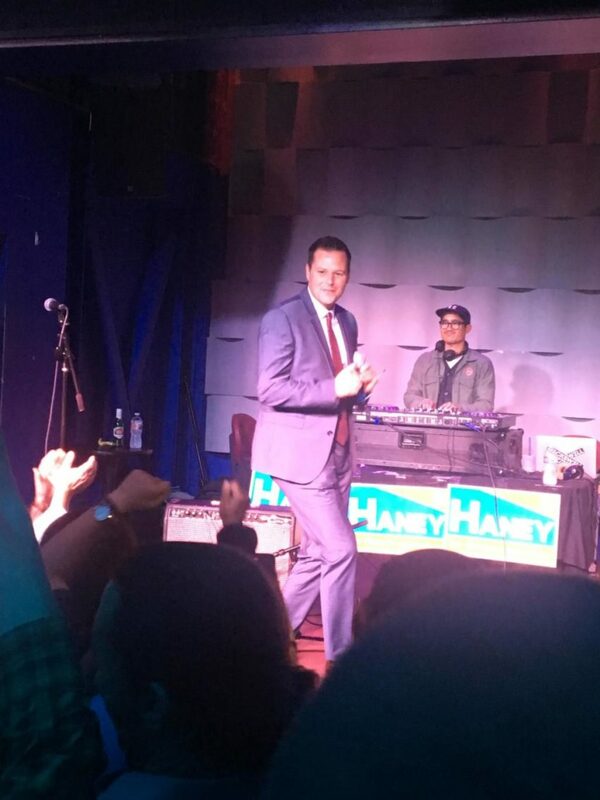 Presumptive Supervisor-elect Matt Haney boogied onto the stage to James Brown’s “Get Up Off That Thang.” Photo by Lauren Smiley. These workers are not the most interactive. They have a tendency to do things like leave 10 door hangers on the front gate of a 10-unit building, which is one step removed from throwing them in the recycling bin. There’s an old saying that’s applicable here: Random stomping seldom catches bugs. Haney’s campaign didn’t just haphazardly wheedle strangers to let them into condos or SROs. They had 120 building captains who’d open the door, and managed to gain entry to some 600 buildings overall. Haney’s campaign had targeted lists. Conversations were tracked and followed-up. On canvassers’ cell phones, individuals’ histories were recorded; you’d know that you had called a person seven times, had one discussion, and that they were undecided. Two weeks before election day, Haney’s campaign had identified 7,000 likely voters. The next two weeks were devoted to wrangling these people to vote — and, it seems, a high percentage of them did just that. They were tracked, after all. Matt Haney had a much more diligent ground game — as this D6 apartment resident can attest. In the last few weeks, a Haney worker knocked at my door, followed by another from a tenant’s rights group and then yet another from a labor group, all working on behalf of Haney. (Our building is of the locked SoMa variety, so you have to have a game plan to get in.) I returned from lunch Saturday to another Matt Haney brochure, purportedly signed in green marker by Matt Haney himself, writing he was sorry he missed me. On Election Day, they called me on the phone making sure I voted, and posted a Haney poster on my door — and all this is with me never saying a committal word about voting for Matt Haney. I only ever got mailers from Sonja Trauss and Christine Johnson. I’m not saying how I voted, but I did have the feeling of Matt Haney’s wide smiling face looking over my shoulder as I did. There are plenty of lessons to be learned from this election. Whether our leaders choose to do so will loom large in all of our lives in the months and years to come. So, all ya gotta do is ‘show up’? Issues be damned? Guess the endorsement from Gavin woulda helped. Does sound like an impressive ground game though. What is the main lesson San Francisco learned in all he districts? YIMBYs are not IN. YIMBYs are out. San Francisco citizens are not ready to roll over, leave home, and give in to higher profits and lower moral standards.